Early in the morning on Friday I drive from Leuven to Genk to Jan's house. 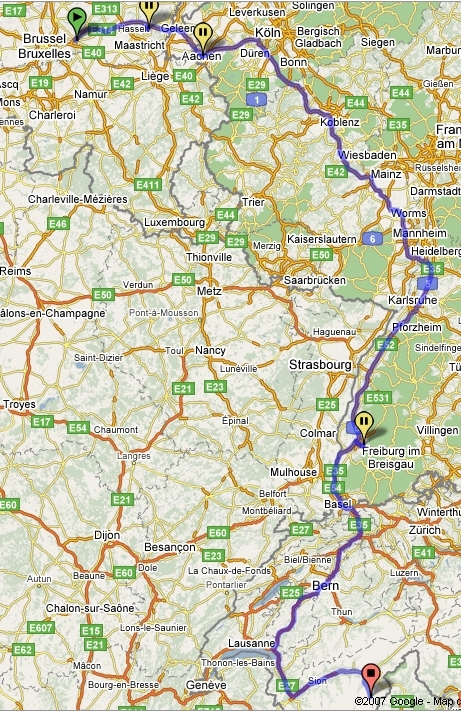 At 6:00 we start driving Jan's car to Germany and from there to Besel city in Switzerland. At 15:00 we reach Saas Fee village in Valais region in Switzerland. We make the plans for our first easy climbing of the next day. At 8:30 we toke the Alpin Express Cable car from Saas Fee and after the Alpin Metro to the Mittel Allalin Station 3454m (9:10). Jan uses tour skis always until the summit while I just walk on te snow. Jan starts skiing down and he takes a T-bar lift to the start point of the route to Allalinhorn 3500m where I walk on the ski pists. Traversing Allalihorn and passing between the two huge crevasses we reach after two hours the saddle at 3800m. A steep snow coverd slope guide to the rocky summit of Allalinhorn 4027 with the big cross on the summit. The last part of our climbing was really hard because we reach high altitude without acclimatization . We follow the same route to the Mittel Allalin Station. Jan ski down the 40 degrees slopes of Allalinhorn. At 15:00 we meet each other into Saas Fee. Staring from Saas Fee and taking all the cab cars like the previous day we start ascending to the Allalinhorn's saddle faster the yesterday. Jan makes the most part of the route by tour skis while I use snowshoes in the easy parts. 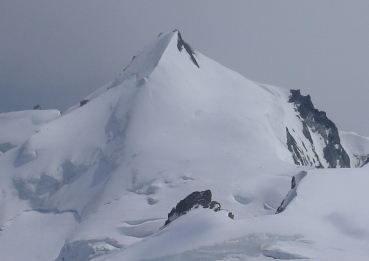 We start climbing the rocky ridge of of Feechopf passing from the summit 3826m and reaching the Feechopf peak 3888m. This is a very interesting and nice route up to III grade for about 500m, with very nice glimpses from both valleys Saas Fee and Zermatt. 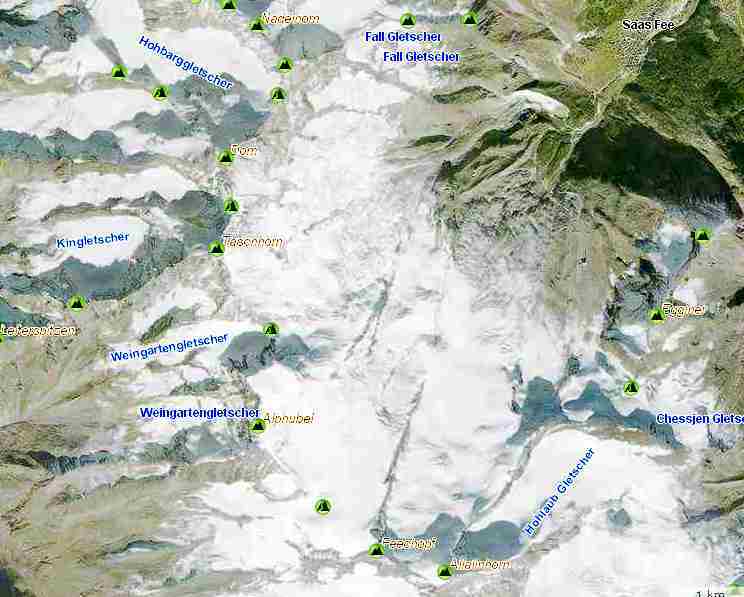 We cross the long plateau until the Alphubeljoch saddle 3773m. From there a snow/ice ridge guide to the summit of Alphubel. The ridge is very interesting with about 40-50 degrees. Late at 14:00 we reach the summit of Alphubel 4206m, where the weather get worst starting to snowing. 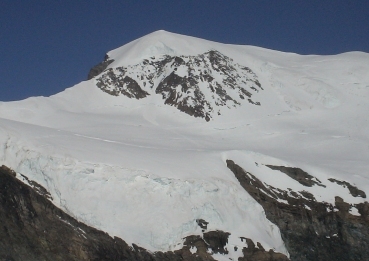 Following the ski tracks we reach after 3 and a half hour the Langflue hut 2869m, following the normal route of Alphubel (PD-). We stay at night in the hut, having a nice dinner, after 9 hours of climbing. Jan takes a lift higher and ski down to the Alpin Express station, while I take a cable car direct to the Saas Fee. At 10:00 we were back to the car. The weather change and clouds cover all the peaks. We could try an other peak next days. We had a short trip around Brig villages up to Blatten area with nice views for Brig's valley. Late at afternoon we start driving back. Somewhere in Germany we make stay to sleep.